The conference is to be held in Workroom 1 of the Diamond, on Leavygreave Road. There are also entrances to the building Jessop's Plaza and St George's Terrace. There are toilets, including gender neutral toilets and toilets with accessibility features, in close proximity to Workroom 1. 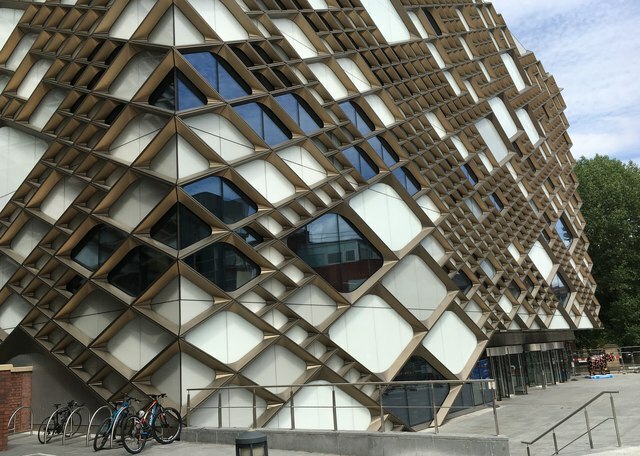 There is accessibility information about the Diamond here http://www.disabledgo.com/access-guide/university-of-sheffield/diamond-29, though do contact the conference organisers if you have any further questions or requests. The Diamond is about a 25 minute walk from the train station. If you'd prefer to use public transport from the station the best option is to take a tram to the University of Sheffield stop, which is on both the blue and yellow lines. From the station take any tram towards Middlewood or Malin Bridge - you pay on board. Trams are wheelchair accessible. Disembark at the University tram stop and head east down the pedestrianised street with a glass and multi-coloured building called Jessop West on your left. The Diamond is the large angular building adorned with diamond lattice on your left after about 100 metres. Take any entrance and signs will direct you to Workroom 1. The 10 and 95 bus routes also stop directly outside the Diamond. The main taxi company in Sheffield is City Taxis (0114 239 3939), who have wheelchair accessible taxis to hire. Parking for visitors is available at the two Q-Parks on campus: Durham Road and Solly Street. Of the two, Durham Road is slightly closer. Disabled parking for blue badge holders is also available next to the Diamond on the Jessop Plaza, which is the area at the top of Gell Street between the glass and panelled Jessop West building on the left and the brick Jessop Department of Music on the right. The spaces are just on your right as you enter the plaza. There's an entrance to the Diamond further into the plaza on your right which is right next to Workroom 1, but note that registration will be by the Leavygreave Road entrance. In the event that these spaces are already occupied blue badge holders are entitled to park in the disable bays of any of the University's parking areas; the University's parking services webpage contains a helpful map outlining the various options (the carpark on Regent Terrace and the spaces outside the Information Commons, which is the large green building just the other side of the tram tracks, are the closest). The two main options for international travellers are Manchester airport and any of the London ones. Manchester is generally the more convenient option - it's a large international airport with fairly regular direct trains to Sheffield (1h 20mins or so). However, given the size and number of airports in London it can often be substantially cheaper, particularly for interncontinental flights, to fly there and get the train up. We've managed to arrange preferential rates with a number of hotels in the city centre, all of which are within a 15 minute walk from the train station and 25 minutes from the conference venue. It's always worth checking sites like booking.com and the hotel's own websites, just in case there are special offers available. Please note that all bookings are subject to the terms and conditions agreed directly with the hotel. Whilst we have negotiated these options to be of assistance to attendees, all booking must be made directly between attendee and hotel; the conference organisers are not a party to or responsible for any booking. A rate of £70 per night, including breakfast. Bookings must be made through this link. 20 rooms have been allocated for conference delegates, on a first come first served basis, for the nights of the 2nd and 3rd. These will be £76 for single occupancy, including breakfast. Bookings should be made through the website, using the code CGRUNIB1. Rooms will be available until four weeks before the conference start date (Sunday 4th June). A 5% discount if you enter the code 'save5%' when booking. This can be quoted over the phone or used via the Leopold Hotel's website. A number of rooms have been allocated for conference delegates at special rates: 20 rooms at £50 on Sunday 2nd, 20 at £60 on Monday 3rd, and 15 at £60 on Tuesday 4th. Again, these are available until 28 days prior to the date of arrival. These can be booked via telephone at 0114 2204000 or via email at stay@sheffieldmetropolitan.com. The booking reference UOSP020717 and the department name (University of Sheffield Department of Philosophy) should be quoted. Airbnb options aren't particularly extensive in Sheffield but may be worth a look. Feel free to get in touch if you want any help with deciding between areas. Image of the Diamond copyright Graham Hogg, licensed for reused under CC BY-SA 2.0.